Isabelle Durrenberger appeared on Show 282, recorded in January 2014, at age 14. 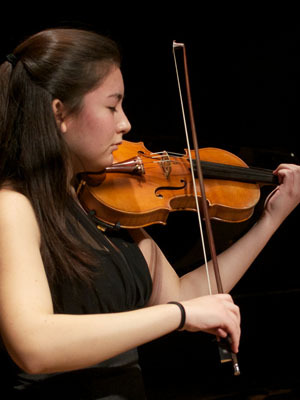 Isabelle Durrenberger (violin), 14, is from Upper Arlington, Ohio, where she attends Upper Arlington High School and studies with Jaime Laredon at the Cleveland Institute of Music. She is a member of the Chamber Music Connection String Quartet as well as the Columbus Symphony Youth Orchestra. She participated in Meadowmount Summer Music Program in 2013. Outside of music, she enjoys reading books, making jewelry, and she especially enjoys watching Downton Abbey.